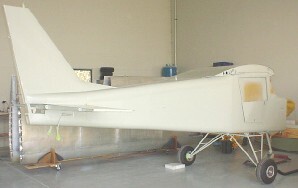 After taking a sample of the vinyl to the local paint store they were able to do a computer match and mix the paint to the same colour and shade. 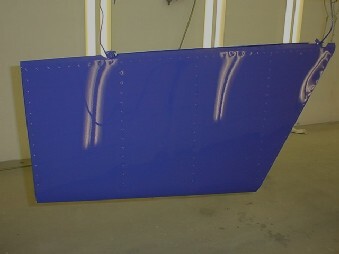 After using etching primer this is the first coat. Only the exposed sections have been painted, the rest will be hidden with the insulation covered vinyl an outdoor type floor mat. 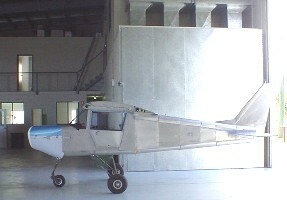 External Paint Scheme: Sterling Chemical Coatings supplied by Scomar Distributors, Qld. Australia. 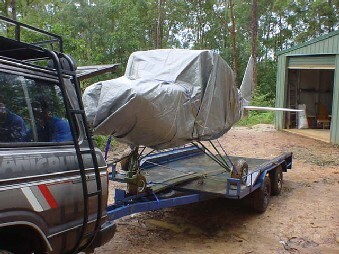 Off all days to chose to move the R80 from the workshop to the paint shop I choose a extremely wet day. In fact it had been raining all week and the mud around the drive made it slippery. Lucky John has a 4 wheel drive and was able to assist with the move as my car was not able to get enough grip to make it up the drive. 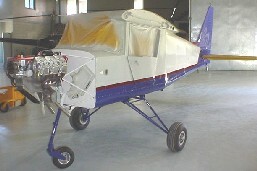 The R80 has its first flight, even if it tied down on the back of the trailer. 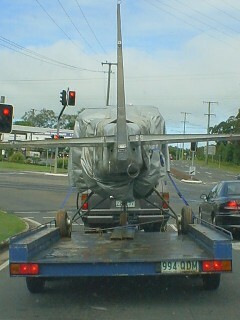 One way to turn heads in the traffic is to tow a trailer with an aircraft as it is not something you see everyday. The 40 minute drive from the workshop to the paint shop in wet and windy conditions went without a mishap. 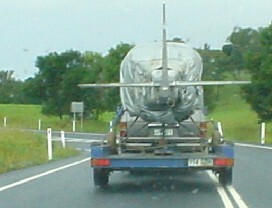 This was the second load as the first trip was to take the wings, spars, elevators, ailerons and other parts. 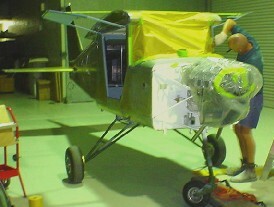 Finally the R80 is in the paint shop at R'n'R Aviation at Caloundra Airport but not before all the mud had to cleaned from the wheels and undercarriage as this CASA approved workshop and paint shop and David and his crew take much pride constructing and repairing the range of Robinson helicopters. 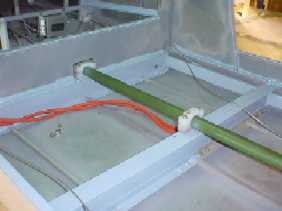 This image shows the main door to the paint booth and the extractor fans ducts. 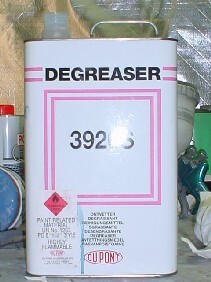 After all traces of oil have been removed and acid etched to deoxidise the metal the surface is alodined to provide a protective chromate conversion coating providing good corrosion protection. 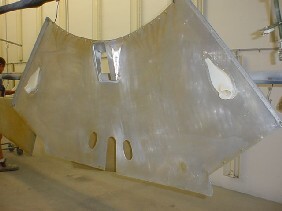 Surfaces are cleaned with a degreaser before the primer coat is applied as soon as the surfaces are dry. 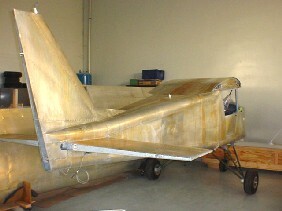 You can notice the golden colour on the fuselage which indicates the surface has been alodined. 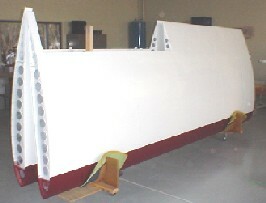 While the painter is applying the epoxy chromate primer, outside the paint booth surfaces that are not going to be painted are masked particularly around the cabin as the windscreen has not been fitted and the interior has already been painted. 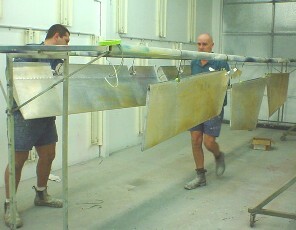 With the primer dry, Jacko has sprayed the first finishing coat on the elevators and rudder. The finish is absolutely magnificent, well I guess you should expect that from a professional working in the environment especially designed for spray painting helicopters and fixed wing aircraft. 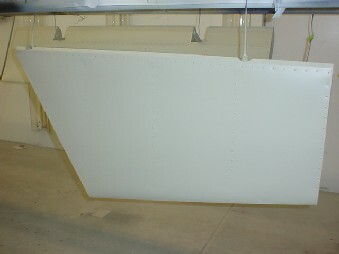 Even though the doors can be removed from the airframe, it was decided to leave them attached and tape up the entrance to the aircraft before applying the primer. 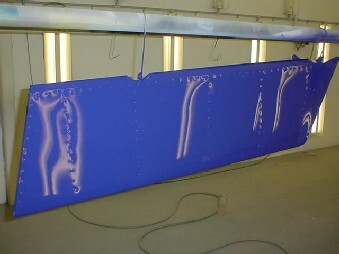 All inspection plates have been removed and the screw heads spray painted as well. 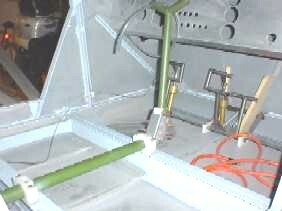 The small dints I put in the metal while working the surface have been filled making a smooth surface. 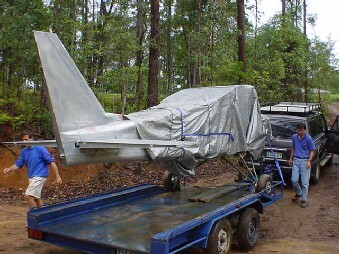 The wings have been painted and secured back in the rack ready for transportation to Hanger 10 at Caboolture airport. 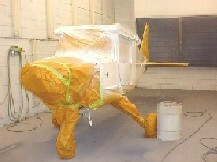 Meanwhile the R80 is inside the spray booth ready for its final coat of white. Out of the spray booth and with the masking tape removed the paint scheme really stands out. An interesting feature is the ionosphere blue, it appears to changes to a purple colour depending on the light intensity. I hadn't planned it that way, but that effect does look good.